1. Havana and Santiago: Leave Saturday, January 13th(*) and return Sunday, January 28th. On Sunday, January 21st we all fly to Santiago. I do recommend this first and longer option, as you will get to experience the two most important places for music & dance culture in Cuba. 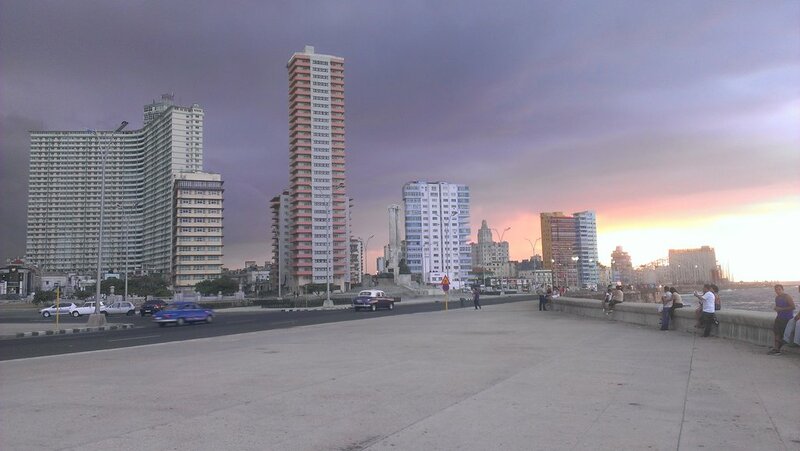 Each city is so different, and seeing both will provide a much more balanced & complete view of Cuba. The main destination in a visit to Cuba, Havana, the captial of Cuba, has the most access to music & dance events along with offering so much more. You will leave with getting an extremely good view of the culture of Cuba. 3. Santiago only: Leave Saturday, January 20th, and return Sunday, January 28th. Santiago is such a special place. You will bond with the city and its people. Recommended especially for those who prefer smaller cities, or perhaps for those who previously visited Havana but missed Santiago. * Depending on where you are coming from and how early you are willing to get up, you may be able to arrive to Havana the same day and thus leave on Saturday, January 13th. Otherwise, you will leave the afternoon before, and spent the night in either Atlanta, Ft. Lauderdale or Miami, and then fly to Havana the following morning/early afternoon. Full time chauffeur-driven car available in Havana for the group everyday & night to take us wherever we need to go. At times we will have a second or third car available to transport the entire group at once. For between 6-8 days & nights of our trip, we will have professional photographer and/or videographer with us capturing photos & videos of our activities - walking around Havana, taking dance lessons, visiting various sites, etc., plus anything else you request. Our photographer in Havana is a local documentary filmmaker, who will become a part of our group, and who will always be happy to share his perspective on life in Cuba. Photos will be distributed on a USB stick in full resolution after returning home. The cost of the trip is $3,300 (double occupancy), $3,550 (single occupancy) per person. The price for the Havana only trip is $2,850 (double occupancy), $3,050 (single occupancy). The price for the Santiago only trip is $2,650 (double occupancy), $2,850 (single occupancy). One spectacular room in penthouse with king-size bed with total ocean view: additional cost of $40 per day. The remainder of the total trip cost minus $500 due on December 15th. Eric has been traveling to Cuba since 1995. He has traveled there 20 times, and spent a total of 24 months there. He has studied dance there extensively and has developed numerous connections over the years. Join him to explore and experience the amazing things Cuba has to offer. The focus of the trip will be dancing and music, but the tour includes exploring Cuba's history, architecture, beaches, and their fascinating people. If double occupancy, tell me the name of the person you are sharing a room with, or, if you would like me to attempt to match you with another traveler to share a room. Note: For Havana, rooms usually have one bed only. For Santiago, rooms usually have two beds. 7. Fill in the info below as it appears on your passport. (Needed to book airline tickets). 12. Understand that this tour will involve walking at a moderate pace of up to 1-3 miles per day. This will be in, depending on the weather, fairly hot, humid conditions. In addition, we will be doing (on about 8 days) 2 to 3 hours a day of dance lessons in well-ventilated, but non-airconditioned rooms. In most evenings we will be going out dancing for 2-3 hours. All activities are optional. If you are tired at any point, you can always opt-out and go home to relax, rest, etc. 15. Any dietary restrictions that could be relevant to this trip - like if you don't eat red meat, poultry, fish, dairy, etc.